Marble is sometimes a controversial material when you’re talking kitchen counters. It is not necessarily simple to care for and maintain. However, when we’re talking marble in the bathroom, it’s hard to find any marble haters out there. Wall-to-wall marble in a bathroom setting is truly show-stopping! Marble staining and etching are commonly misunderstood. Those dull “water spots” and “glass-rings” (etch marks) are often misunderstood. Then, too, a large majority of people hold misleading beliefs and have inaccurate assumptions as to how to polish marble or how marble polishing is actually performed to create a polished surface. A large majority of people think that the shine or polish on marble comes from applying a sealer, lotion or chemical substance during the marble cleaning process. Also, some believe that all marble is supposed to be highly polished and that the dull etch marks are some type of “stain”. Well, none of the above is true, but some of it is not entirely false either, which demands some further explanation below to explain precisley why your marble lost its luster? Are your marble countertops looking dull, perhaps with light scratches in the surface? Heaven Sent Floor Care can restore their luster while removing light imperfections with either a refinishing process or by polishing them. Countertops make an immediate statement about the style in a room. A scratched, burned or dirty countertop makes a room seem old and outdated, regardless of its other features. Replacing a countertop can be difficult and expensive, but refinishing can do the trick just as well. While there is one situation (etching – see below) where a chemical compound (i.e., honing powder) can be used to achieve a matte or high sheen on marble, it utilizes a physical process (similar to sanding wood) to restore the shine. The chemical by itself does not supply the shine. The marble countertop illustrated below involved 200, 400 and 800 grit diamond abrasives to remove the etching and restore the sheen. 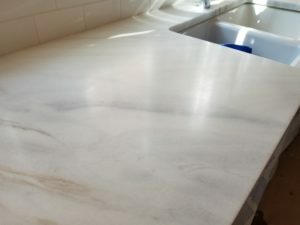 In addition, we used 600 grit honing powder to ultimately restore the marble countertop to a high honed pristine conditon. Also, this specialized process is designed to work on travertine or limestone too that was originally polished to a shine. So, it restores a damaged shiny finish, but is definitely insufficient to create that shine from raw marble to begin with. Is A Professional Marble Polishing Company Necessary? Long story short creating a particular finish on marble (or any natural stone) or polishing marble to make and entire countertop or floor “shiny” is not a Do It Yourself project. 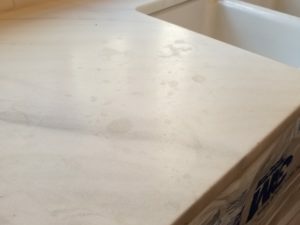 A certain finish can be changed or re-finished after installation, but this requires the skill of an experienced marble repair restoration company using special tools, abrasives and a multi-step process not just a wipe down with a chemical or “polish”. So, if you spill acidic orange juice (or any of the many other acidic foods and beverages) on marble it absolutely will corrode the surface. This corrosive chemical reaction will essentially eliminate the shiny surface layer achieved from the marble polishing process described above revealing the dull marble underneath. 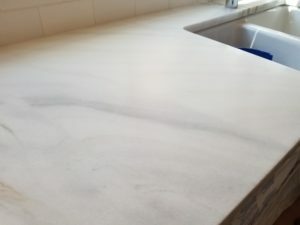 In a similar fashion, if you use the wrong products for cleaning your marble counters (too acidic or too alkaline) you can damage the shiny finish over the whole surface making your entire marble countertop or floor “dull”. Etching begins on contact and the longer the exposure the more severe the etching. And sealing does not prevent etching (re-read that). You must prevent contact with the reactive substances. An etch mark is not a stain. Nothing has absorbed into the marble. Also, plain water (unless acidic like some well and city water supplies) does not cause this. Etching and staining are two completely different processes. You may hear or read that “marble stains easy”. Actually marble does not stain easily it “etches” easily and most (including many in the stone industry) ae not educated to know the difference. The good news is that your marble can almost always be restored to “like-new” condition. Call Heaven Sent Floor Care TODAY if you live in the DFW Metroplex area @ 214-763-8832 to restore your marble countertops or click here to REQUEST A QUOTE.